Scenic overlooks of San Pablo Lake. 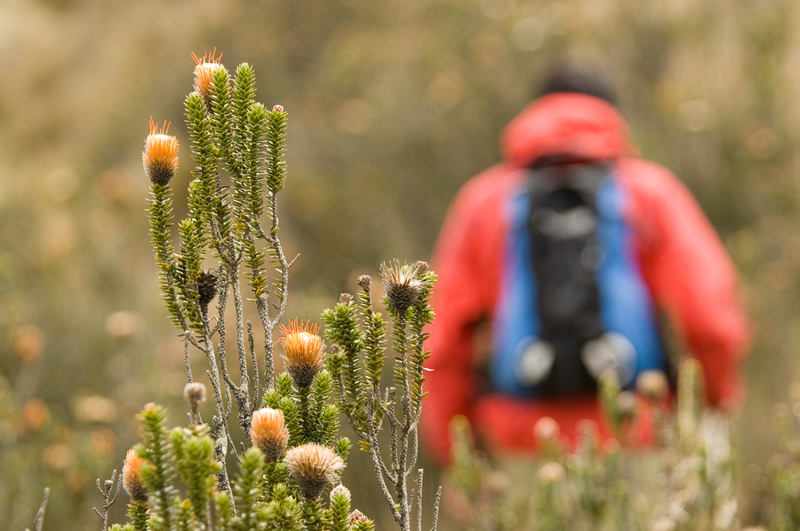 Hiking through the tall grass páramo landscape. Imbabura is a dormant volcano located 35 miles (60 km) north of Quito. Its gentle slopes make it a perfect acclimatization climb for those preparing for Ecuador’s famous high altitude volcanoes. 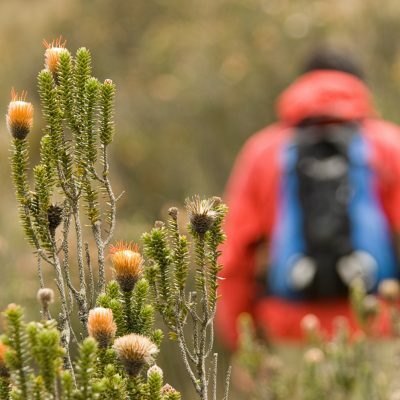 Highlights include hiking through tall grass páramo and rocky outcroppings followed by lush vegetation higher on the mountain. Imbabura overlooks San Pablo Lake, Ecuador’s largest natural lake. The best views of this impressive crater lake are found on the route that we will be climbing. There are two main summits on Imbabura. The higher peak (100 m/328 ft) is reached by traversing a knife edge crater rim from the north summit of the normal route. This is a Class 3 climb, because of the loose and exposed rocks that make the last few meters more treacherous than the majority of the climb. The peaks of Imbabura were once glaciated, and used to serve as an important ice source for the nearby villages. People would climb high onto the mountain to get ice from the glacier and carry it back to sell at the markets in the villages of Otavalo and Ibarra. Today the village of Otavalo is still famous for its large market, although it is now largely a craft market selling items such as vibrant textiles, wood carvings, and the misnomered Panama hats (which actually originated in Ecuador). There is an optional cultural extension which includes a short hike near San Pablo Lake, a native bird of prey demonstration and a visit to an active Quichua craft village hiking past the Cascada de Peguche along the way. San Pablo Lake is a popular lake for scenic hikes. The Parque Condor is a reserve created to rescue and rehabilitate native birds of prey. Among the many birds they work with are the Andean condor, the national symbol of Ecuador. Here we will be able to see free flying demonstrations and many species of birds of prey such as kestrels, small hawks and condors. On our hike to the village of Peguche, we will pass by the Cascada de Peguche, a lovely waterfall where we will stop and have lunch. This is a site for ritual purification for the Otavalo people. Then on to Peguche, where we will visit a museum about the native way of life and weaving tradition and visit a loom weaving and flute making demonstrations. We drive to the foothills of Cubilche, where we will enjoy an easy 2-3 hour hike to this popular scenic overlook. From here, we will enjoy the great views of Cayambe,Cerro Cotacachi and Imbabura. There is a small hidden lake where We will stop for lunch. That evening we will stay in a picturesque lodge in La Esperanza and prepare for the climb. We’ll drive to the trailhead at 6 a.m. and after an 5 hour climb we’ll reach the accessible point below the summit (the true summit is exposed and would take 8 hours). The descent will take another 3 hours. Then we will drive back to Quito. At the end of the second day we will check into a hacienda on the shores of San Pablo Lake. The next day, after breakfast, we will enjoy a short hike by the lake. Then we will visit the Parque Condor for a bird of prey flight demonstration. Followed by a hike to the Cascada de Peguche and the nearby Quichua village with tapestry and flute making demonstrations. Drive back to Quito.